Happy May first! Today marks the start of my favorite time of year. May-August are my favorite months and my summer break will be here before I know it! There is nothing I love more than shorts and sundress weather! Today I am sharing the top ten selling items from the month of March. Many of the top sellers were pieces I took on vacation with me that are perfect for a getaway or the upcoming months! Check out the most popular items below! So nice, I bought it twice! I love this under $35 peplum tee so much that I picked it up in two colors! It’s definitely oversized, I sized down and am wearing an XS here! It’s such a comfy piece and is easy to layer! These wrap around espadrilles come in 5 colors and are under $100! I love the neutral color…they will go with everything this spring and summer! 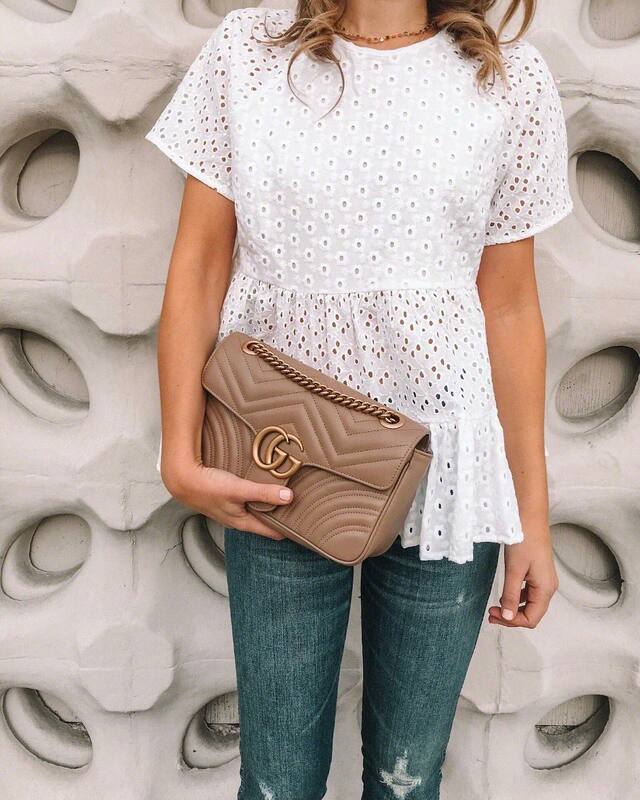 This sweet little eyelet top made the list last month and it’s no surprise it’s a top seller again for April! It’s under $50 and also comes in black! It’s such a sweet spring piece! I’ve been yellow obsessed lately so I had to pick up this linen dress for my trip to Mexico! The quality is amazing for the under $50 price tag! It also comes in a pretty coral and a fun polka dot print! I shared these pants on the blog last week. I’ve worn them on vacation and in the classroom. I love a piece that is comfy and versatile! What’s even better? That they are on sale for $30! I am loving tying bandana’s in my hair lately, and this pink printed option is so cute! 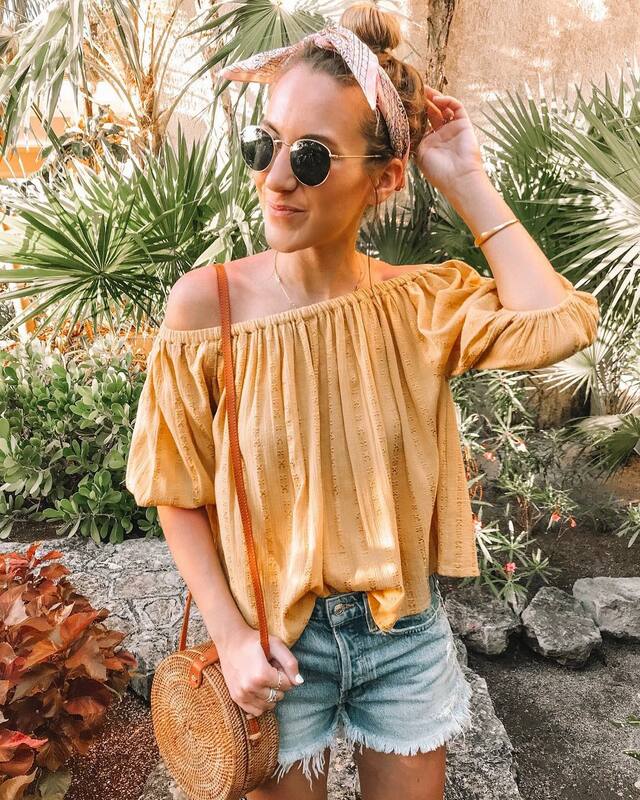 I’ve found so many fun ways to style this cutie, from tying my hair up with it to adding it to a bag for a fun pop of color! Another repeat from last month! 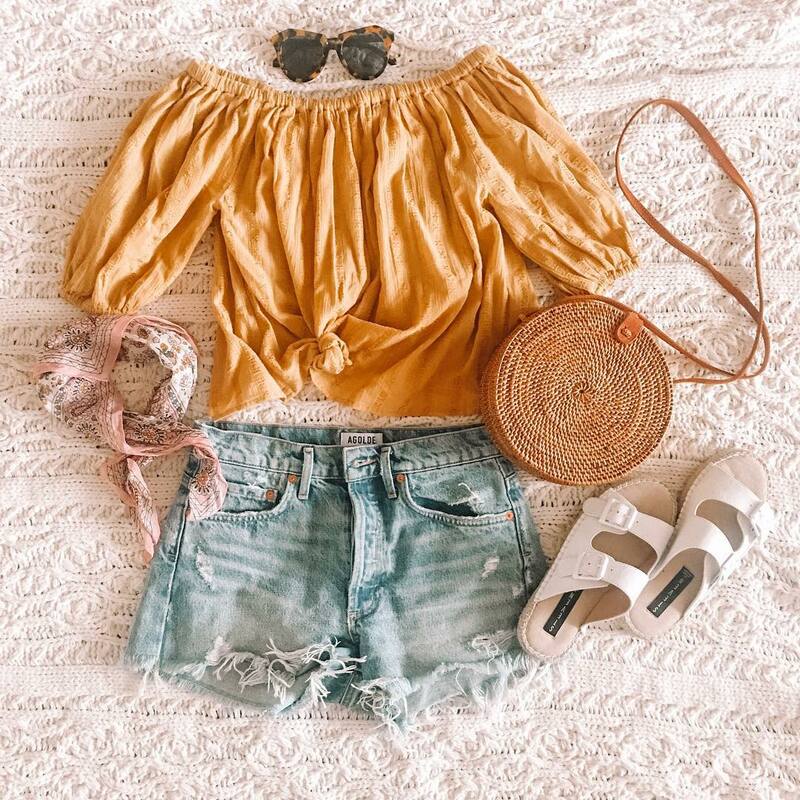 These shorts are spendy, but definitely worth the splurge! The fit is amazing and I love that they are slightly longer in the back for full booty coverage! The leg is also a little wider, making them SO flattering on! I don’t know about you, but there is nothing that I love more than when I find a great pair of denim shorts! I will be wearing these all spring and summer long! This hat is HANDS DOWN my favorite! I’ve had it for 3 years and wear it all the time in the spring and summer! It’s even done some traveling with me and has held it’s shape after being stuffed in my suitcase! I’m considering picking up a backup option because I see this hat being one of my closet staples for a long time to come! When I started seeing these sandals pop up everywhere, I knew I needed them! I love that while they look like a much pricier designer pair, they are actually under $100. They are very comfortable and a great shoe for traveling to the beach as they go with everything and are easy to slide on and off. They come in a bunch of colors too, but I love the pop of white for spring and summer! Who doesn’t love a graphic tee? This one is SO FUN for vacation and currently on sale for just $7! I took this to Mexico with me and it was the top seller for the month of April. A cutie saying paired with an under $20 price tag? SOLD! Check out all of the other cute tees here! I love all of these looks, so versatile!